By geological timescale estimates, the Marcellus Shale aka the Marcellus formation was formed roughly 390 million years ago in the middle Devonian epoch in the Paleozoic era. 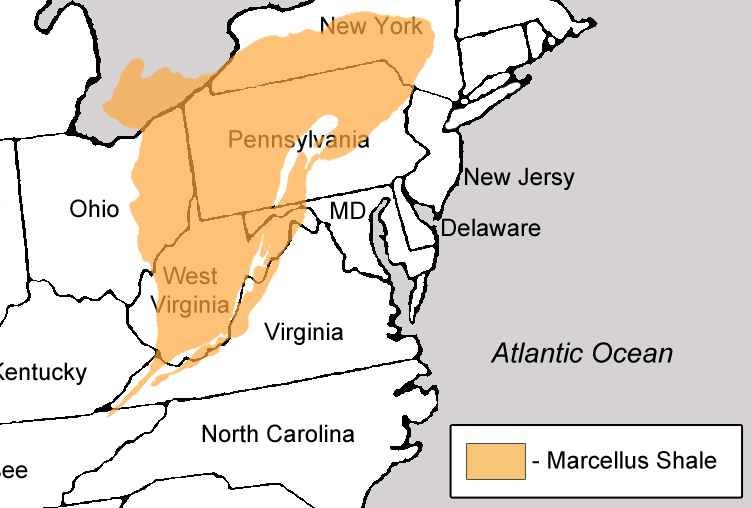 The Marcellus Shale is named after the town of Marcellus, New York near where it outcrops at the surface. It extends throughout the northern Appalachian Basin, including southern New York, Pennsylvania, eastern Ohio and West Virginia and also includes slivers of Maryland and Virginia. The United States Geological Survey estimates the formation’s total area to be around 95,000 square miles, ranging in depth from 4,000 to 8,000 feet. The Marcellus is black rock shale that formed in deep ocean waters containing very little oxygen. Like all shales, the Marcellus is a sedimentary rock formed from mud and composed of fine-grained material such as clay, quartz, organic matter and other minerals. Since shale porosity (pore spaces) is less than 10%, the permeability (ability of liquids or gases to pass through) of shales is very low, which inhibits the economic production of oil and gas from shales. Geologists knew for years of the presence of natural gas in the Marcellus formation. However, due its naturally low permeability, few conventional wells were either drilled or produced. In 2005, with a well in southwestern Pennsylvania, Range Resources changed the history of the Marcellus and kicked off the current play by applying drilling and completion techniques that it learned in the Barnett Shale play of North Texas. By drilling horizontally and using hydraulic fracturing, Range was able to improve the natural permeability of the Marcellus shale formation, which significantly increased the flow of natural gas and made the play economically viable. Even with the decline of natural gas prices over the last five years, the development of the Marcellus Shale has been dramatic since Range drilled the first horizontal well in the play. In Pennsylvania alone, over 6,000 horizontal wells have been drilled. And the Oil and Gas Journal reported in its March 2013 publication that the Marcellus shale play has reached a production rate of more than 7 billion cubic feet of gas per day, making it the largest U.S. gas-producing play.